Delectable! 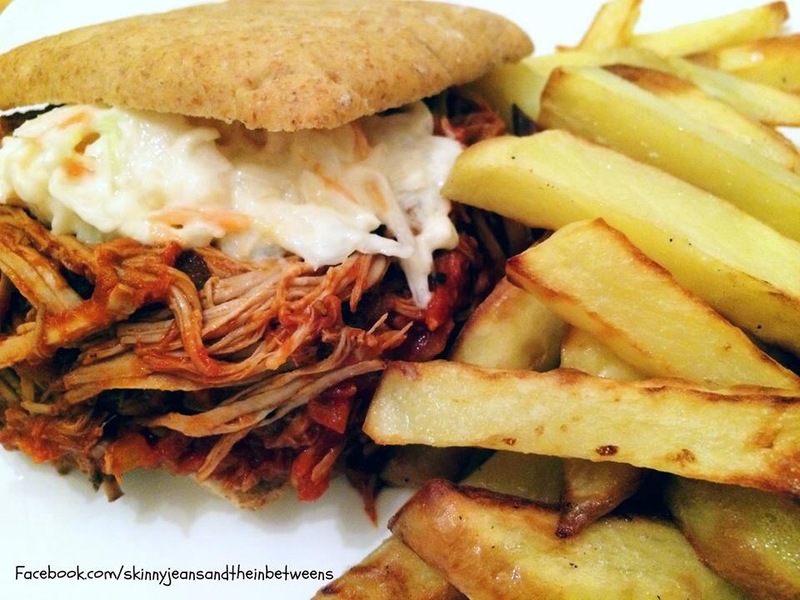 Soft as velvet pork & the smell of BBQ aroma in your kitchen is just divine! Only 2pps on Filling & Healthy! Remove all visible fat from the pork. Mix all the rub ingredients together & rub well all over the pork. Cover & refrigerate for as long as possible, preferably overnight. Slice an Onion into 4 thick slices & place in the bottom of the slowcooker (or in an ovenproof dish if cooking in the oven) Place pork on top & pour chicken stock around. Cook on low in the slowcooker for 8 to 10 hours (150c Oven for 6 to 8 hours) until pork is cooked through & fall apart tender. Lightly fry onion in spray oil until softened approx 5 mins. Add Garlic & fry for further 30 secs to 1 min. Add all the remaining sauce ingredients & simmer for 25 to 30 minutes until sauce slightly thickens & becomes glossier. Peel potatoes & slice into chip shapes. Place in an even layer on a plate & microwave for 3 mins. Place on a baking tray in an even layer & spray with oil. Bake in a preheated oven at 200c for 25 to 30 mins until cooked through & browning. Remove Pork Shoulder from cooker & discard the onion & chicken stock. 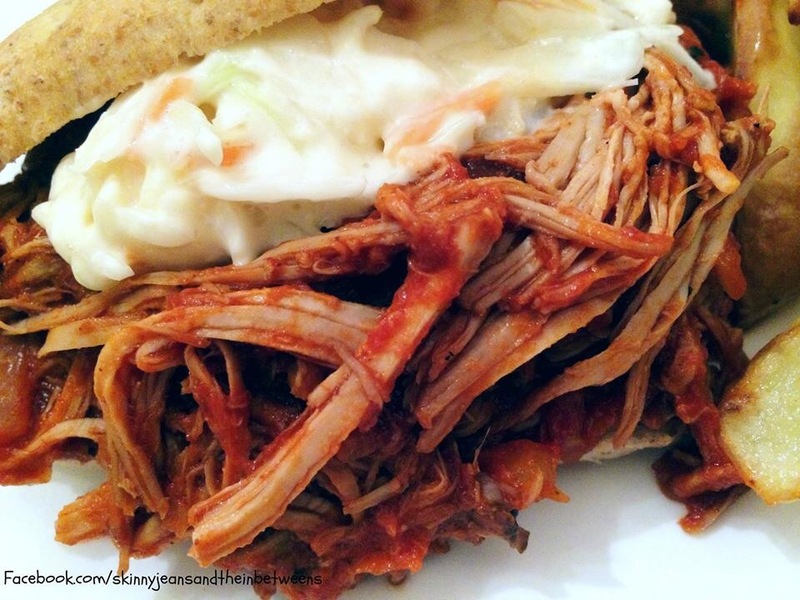 Use 2 forks to shred the pork. Mix BBQ sauce through & keep warm. 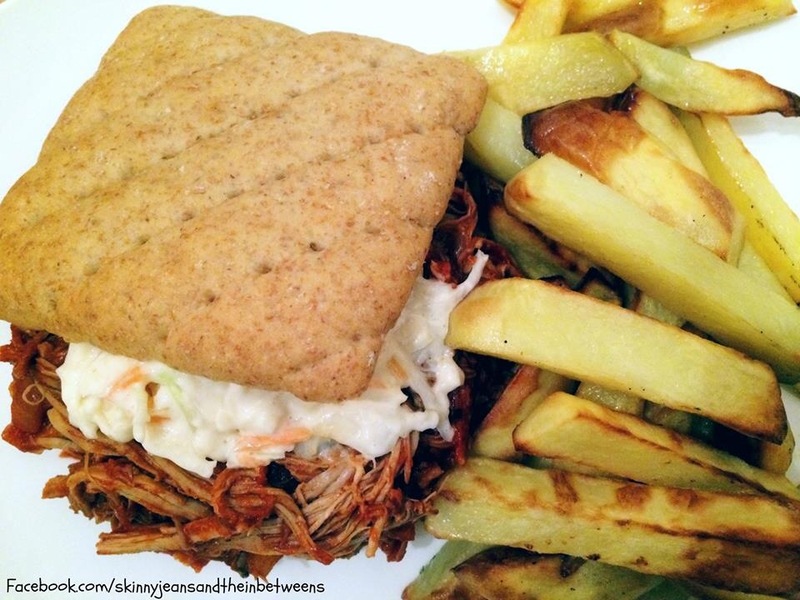 Serve on a Wholemeal Sandwich thin with 1 Tbsp of reduced fat coleslaw & the fries. Enjoy!